In the beginning of the year, it is even more important to find ways to support children in building relationships. Children at Johnson Toddlers have been playing with bubbles – chasing them and popping them. Bubble play facilitates and supports the children in building relationships and connections with peers and educators, as they share delight and joy, laugh together, and poke, pop and chase the bubbles. 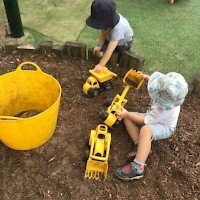 Johnson House Preschool have also made some changes in their outdoor environments, creating a space including diggers, trucks and dump trucks. The children have been exploring the diggers and dump trucks, working out how to move the vehicles on uneven ground and transporting the wooden logs from one spot to another. Some children used the logs to build a cave while others worked with one another to carry the heavier logs. 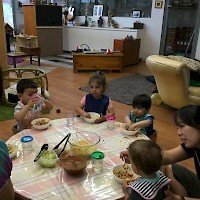 Spaces like this support the development of children’s social skills, ability to work together, language in communicating their ideas and their imaginative thinking skills. For the month of January, educators at Murray House have been focusing on building close connections and relationships with children starting their new care environment. Applying the principles of Circle of Security, educators strive to settle the children by responding to each child’s emotional needs to provide comfort during the transition. Primary focus educator groups are used to ensure that each child and family is supported by having a designated educator to communicate concerns and relay feedback during drop off and pick up. As part of promoting healthy eating for children, Gorton House have a ‘Super Broccoli’ soft toy who goes home with children for an adventure once per week or so. This month Super Broccoli returned after having lots of adventures with one preschooler, who had spent a lot of time with Super Broccoli. Super Broccoli had enjoyed drawing and learning about about Bread Hero, a Japanese character formally known in Japanese cartoons as ‘Anpanman’ that teaches children about healthy eating, just as Super Broccoli often does. Our preschooler was eager to show her friends and teachers the pictures she had drawn, and just as eagerly launched Super Broccoli off to the next host. Having Super Broccoli has really helped to generate a lot of discussion and interest in healthy eating with the children at Gorton preschool. 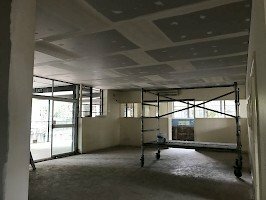 Although there are no children or educators in Rigby House this month, plenty of things were happening with the renovation! Designing learning environments for children that are engaging and inviting is vital for the ongoing development of children’s play and learning. 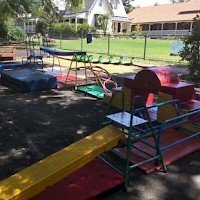 Spaces that provide children with structure and clear intention support development of problem-solving and enquiry skills. Children in Robinson house have been involved in evaluating the spaces and play environments both indoor and out. As a result of this process significant changes have been made – below are some of the new outdoor play spaces. Summer time in the garden on the Northern Beaches brought some interesting discoveries after children found a cicada ‘shell’ (exoskeleton). The educator used the opportunity to explore the nature cycle and talk about life in the garden, and how insects grow and change. 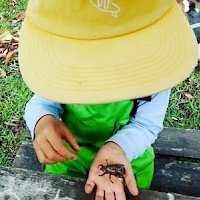 Connecting children with the natural world is a crucial part of their learning as they explore relationships with other living and non-living things and observe, notice and respond to changes. 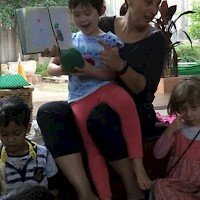 At Randwick Family Day Care playgroup, as part of a plan to help children gain an understanding of different animal habitats, a small frog pond was recently installed on the back lawn. After researching the types of plants that were required and installing them, educators and children were rewarded with a film of frog spawn on day 3! This new resource helps children to learn about how we are interconnected with the natural environment.